Passenger Safety has been an issue almost from the beginning of mechanised road vehicle development, which dates back to the 1700s. This is evident from the fact that nearly 1.3 million people die world-wide in road crashes each year, and an additional 20 – 50 million are injured or disabled. With crashes resulting in damages to the human population at large, there was a great need for the then society to safely use the automobiles and thus laying the foundation steps towards the ideology of safety mechanisms in the automobile. Human life is undoubtedly the most significant element on the earth, and within the natural propensity of protecting one’s life, symbolic inventions rolled out to provide safety to the automobile passengers. 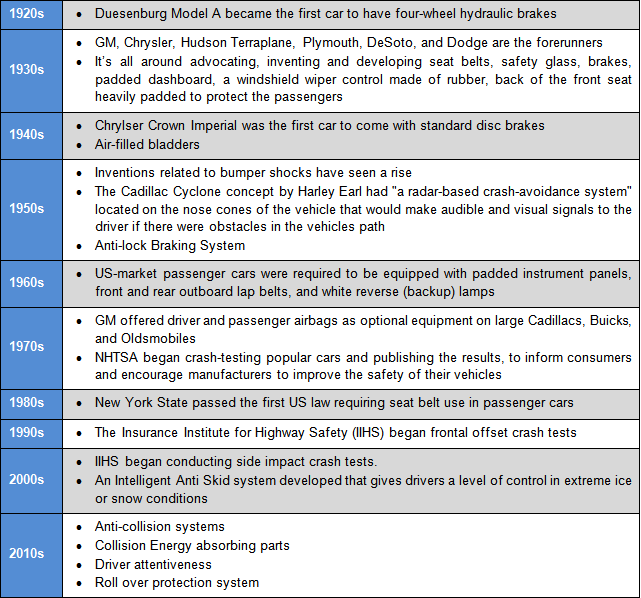 Here is a quick snapshot outlining the evolution of the safety systems in the automotive Industry in the last century. The first patent on seat belt was granted to Edward J. Claghorn of New York, U.S. Patent 3,12,085 in 1885. The airbag specified for automobile use, traces its origin to air-filled bladders as early as 1941. The inventions falling in the area of airbags, seatbelts, anti-lock braking system etc. improved the level of safety over the last few decades. As we stand today in a technology smart generation, the mechanical way of handling the collision load is combined with smart technology that’s incorporated in the vehicles. Several ways of detecting collision possibilities are designed, one of which is to determine the distance between the vehicles and alerting the driver. Nevertheless, in case a collision occurred, immediate detection of collision load and mechanisms of alleviating the actual load value to reach the driver and passengers is accomplished with arrangement of load absorbing units at appropriate locations on the vehicle chassis. New features added of late that are of interest include seat belt indicator, door lock state identification, roll over protection, anti-collision system, collision detection system, driver alertness system, collision load absorption system etc.. In the recent years the focus has been on the development of collision detection/avoidance system with the help of sensors. Researchers are also keen on designing the mechanical ways to limit the collision energy from reaching the vehicle occupants. 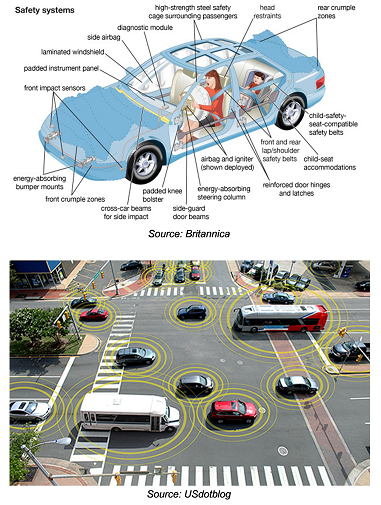 Anti-collision system is the most sought after research area, in the field of vehicle safety system. While the passenger safety features added to vehicles for safeguarding the occupants, however, the system would be futile if the driver remains inattentive. Driver distraction is identified as one of the major reasons behind the growing traffic fatalities in US which can be reduced greatly. Auto executives believe consumers are still fixated on traditional product issues, with fuel efficiency rated clearly as number one, closely followed by safety and comfort. 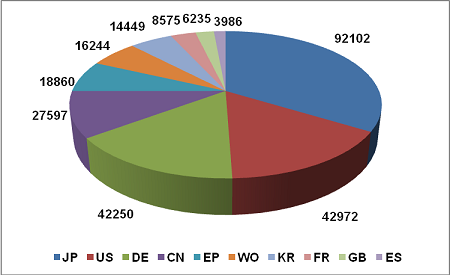 A patent search based on the automotive safety system related patent class codes reveals that Japan patent office leads the global distribution of patents. 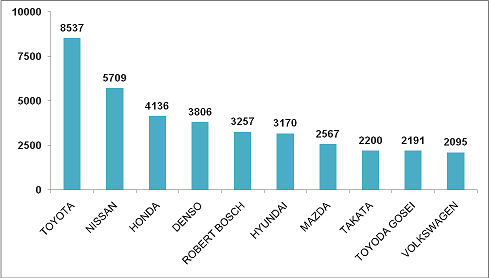 It’s also evident from the fact that Japanese automakers, Toyota, Nissan, and Honda are the major innovators in the automotive safety industry. The increase in patenting activity has also resulted in an upsurge in patent infringement suits. Many big players are sued on a wide range of safety features, from mechanical brakes to electronic keyless entry and airbag sensors and lane departure warning systems. Many infringing parties have settled by entering into million dollars agreement. Besides, millions of dollars are being invested in order to explore the feasibilities of collaborating all the safety features. We are pretty sure that the advanced safety features coming together in the vehicles, will increase the passenger safety.